Are Surge Protectors, Extension Cords, USB Outlets cruise compliant? Almost daily, we’re asked “can I use a cruise power strip in my cruise ship cabin?” There’s a lot of misleading information out there regarding what’s compliant and what’s not allowed by the cruise lines. We’re here to clear up all of the confusion and to give you some good news about your ability to bring a cruise power strip onto your upcoming sailing. 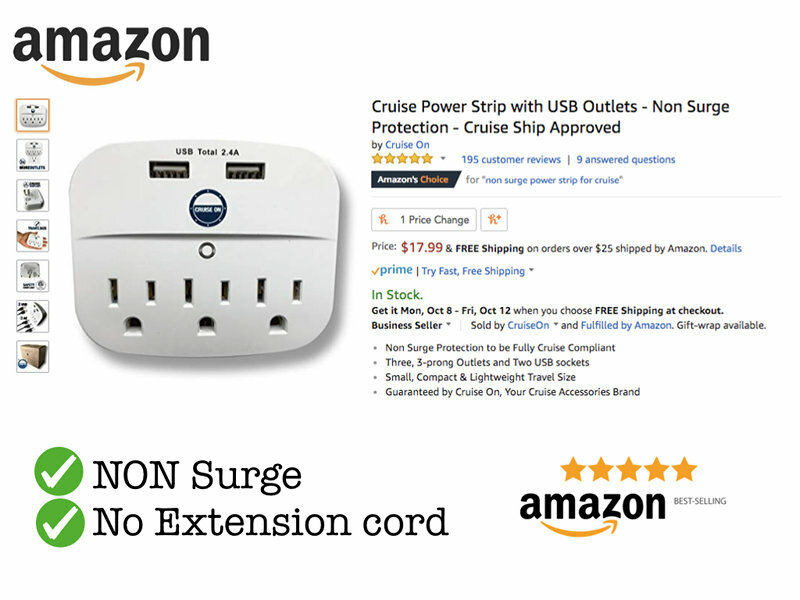 Why do I need a cruise power strip? You don’t technically “need” extra power outlets. We have a half-uncle who’s a Quaker and we’re pretty sure he wouldn’t bring one to use in his cabin. We’re not Quakers, though. We love our technology. The only thing that we don’t love about our gadgets is their constant need for power and therefore electrical outlets. If you’ve ever cruised, you know that cruise cabins have two outlets. One is in the main cabin area and the other in the bathroom. The outlets in the bathroom are essentially useless unless you want to stick your phone or laptop into the sink while charging. Check out this short video where a scary security officer man explains things. At any given time, we may want access to the following electronics. All of those need juice and your cruise cabin is not equipped to keep them happy. That’s why we take a cruise power strip on every sailing that we go on. Running up and down 12 flights of stairs to charge your phone then to get your charged phone is for the birds. Oh, and it stinks missing a photo-op because your device died! 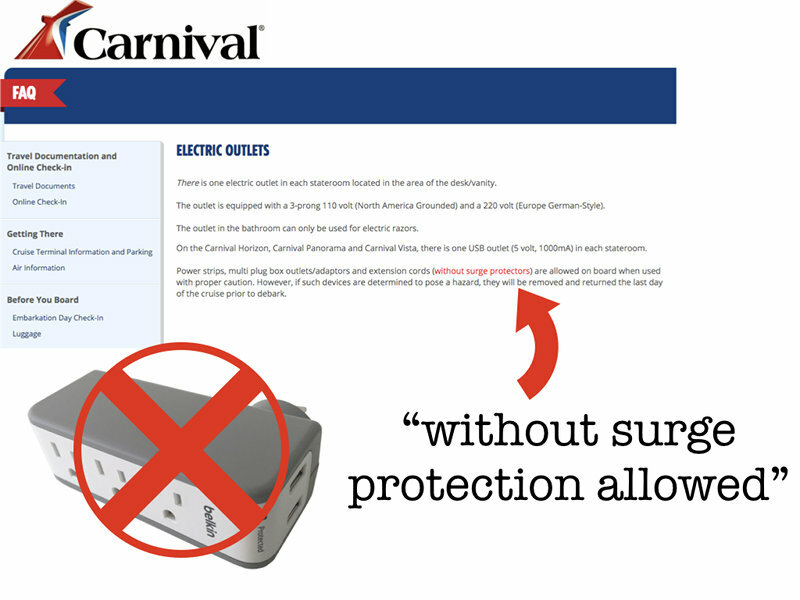 Ok, ok, so now that we’re all “on board” for bringing extra outlets we need to figure out which is cruise compliant and which aren’t allowed by the cruise lines. This is very important. I’m sure we’d all much rather be at the Lido Bar than below decks getting grilled by security. If you take the wrong item, your luggage could end up costing you hours of precious cruise time. Even worse is the embarrassment. Cruise line policy forbids power strips with extension cords. 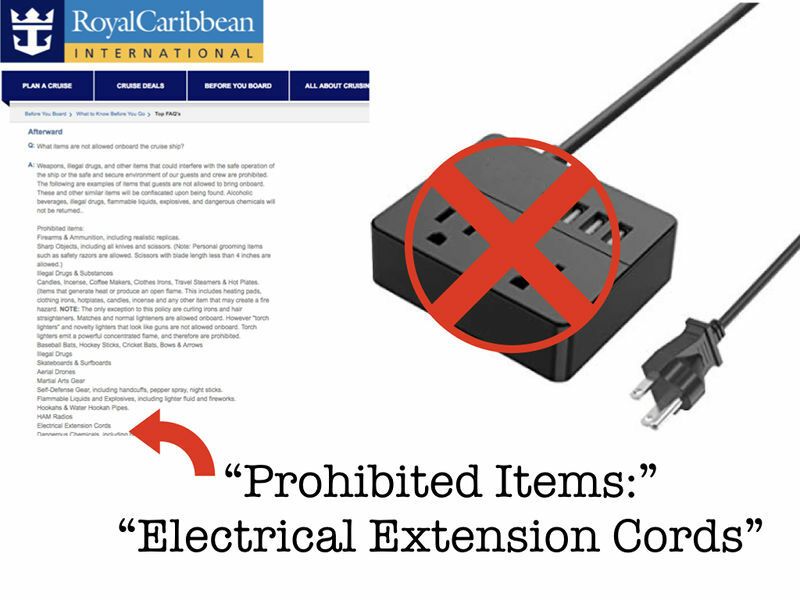 In their list of items that are not allowed, “Extension Cords” are explicitly listed as banned. If your power strip has a cord, it could get you time in ship jail. Ok, that’s a bit extreme. But, it will likely get confiscated and cause some increased heart rates as the officer digs through your stuff. You can find this stated on Royal Caribbean’s website here. Royal Caribbean owns Celebrity, Azamara, TUI, Pullmantur, and more cruise lines. You can expect that these other cruise lines have the same policies on forbidden items. Surge protectors are also banned by cruise lines and will be confiscated. More seriously, they actually pose a risk to the cruise line operation and to fellow passengers, so we very strongly urge you to leave these at home. Below you can see the exact wording used by Carnival Cruise Lines on their site. Carnival Corporation also owns Princess, Holland America, Costa, Cunard and a few others, so you can expect the same policy for those guys as well. On Carnival’s web site, you can see that they specifically note the following. Power strips, multi plug box outlets/adaptors and extension cords (without surge protectors) are allowed on board when used with proper caution. However, if such devices are determined to pose a hazard, they will be removed and returned the last day of the cruise prior to debark. Most power strips are made with surge protection. It’s rare to find one without. Fortunately, we found a completely cruise compliant product made by our friends from Cruise On. We’ve gotten to know the team that makes this product and they’re amazing.While the link below is an affiliate link, we couldn’t be more supportive of this product and all of their other cruise accessories. If you don’t believe us, just look at the hundreds of amazing reviews they’ve received. It’s also the only cruise compliant power strip available anywhere that we could find. Click below to purchase this from Amazon. This will be the best cruise accessory you’ll purchase. Hopefully this post has been helpful. We specifically sited (and linked to) the cruise lines’ policies to eliminate any misinterpretation. Please use the share buttons below to help others with their purchase! Friends don’t let friends end up in cruise jail. Does this work on a Costa Diadema ship?